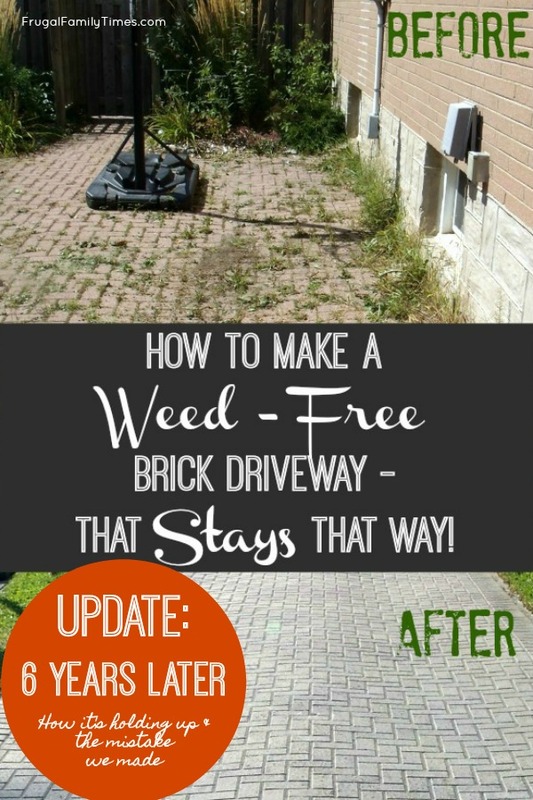 Hundreds of thousands of readers have visited our post to learn how we made our brick driveway weed-free. We've heard great success stories from lots of people! Six years later it's time to update you on how it's doing - and to make a couple of improvements. There are a couple of things we're wishing we did six years ago. That's what we're tackling out there today - and sharing for you here. You can see in our latest photos - some weeds have returned. They are quite small weeds, and are easy to pull, but they're there. They only started to plant themselves about 2 years ago - about 4 years after our big makeover. We call that a success because every other strategy we tried previously lasted about two months tops. So this method works out to 24 times better! We realize now that the problem we could have solved back then - and we're forced to tackle today - is the edges. Darn you, Edges!!!! Don't forget to address your edges, folks, they will haunt you later! When we first completed the project we did not place an edging material along the sides of the driveway - and this we believe is the source of our problem. 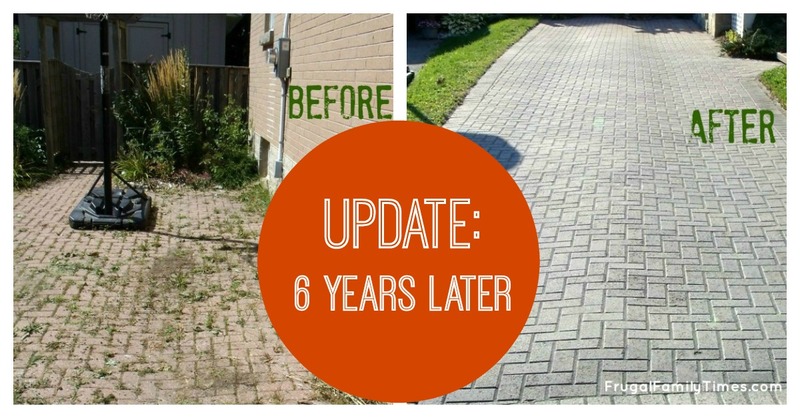 When my dad first installed the driveway 30+ years ago he used pressure treated lumber to edge along the bricks. (Our family has owned this house since it was built in the late 1950s.) Pressure-treated worked well for the first 10 years or so - but then it started to shift and break apart. Also, the PT edging heaved in spots and in our safety conscious wisdom we pulled them out completely to avoid tripping anyone. In our naive dumbness, we didn't replace them with anything. Womp Womp (sad trombone). 1. Edging holds the polymeric sand in place. We live in the harsh Canadian climate - that means snow, lots and lots of it - and the shovelling of snow. We're fairly certain that snow, shovelling and rain have eroded that miracle product from the edges. It's not nearly as sealed as the centre areas. 2. 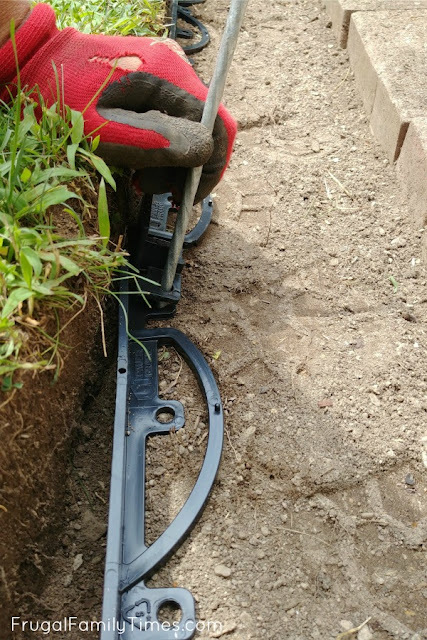 Edging keeps the roots of weeds and grass from sneaking under and through the polymeric sand. We have a paver pathway that we made from scratch 10 years ago. 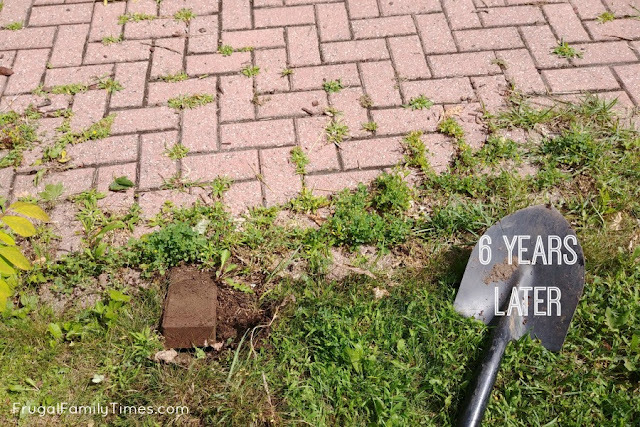 We did that one right the first time and used a paver edging product - and a decade later there aren't any weeds creeping into it. Lesson learned! Sweat. So so much sweat. Edge back to give yourself a nice, clean starting point. 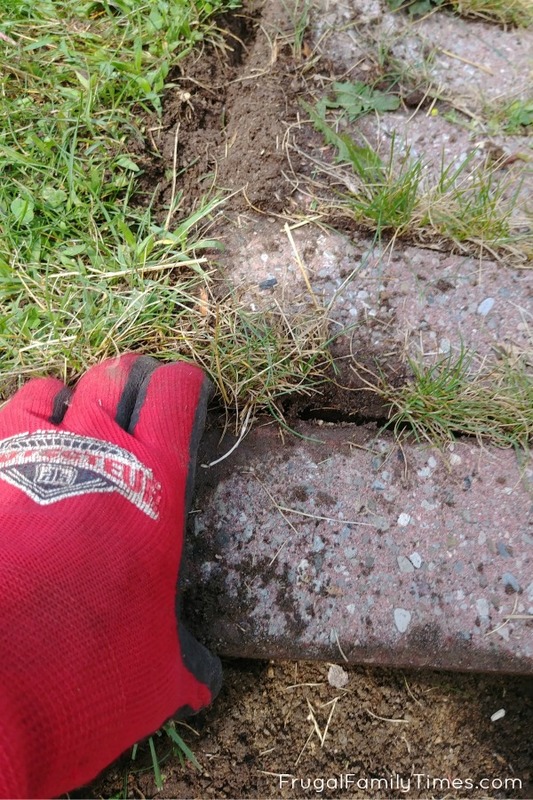 I couldn't get over how far the lawn had crept in and over the brick pavers. You're going to need to pull up the border row to put in the plastic edging, so make peace with this and do a good job cleaning up the edge. Another shot to show how much lawn and weeds had crept into the seams. 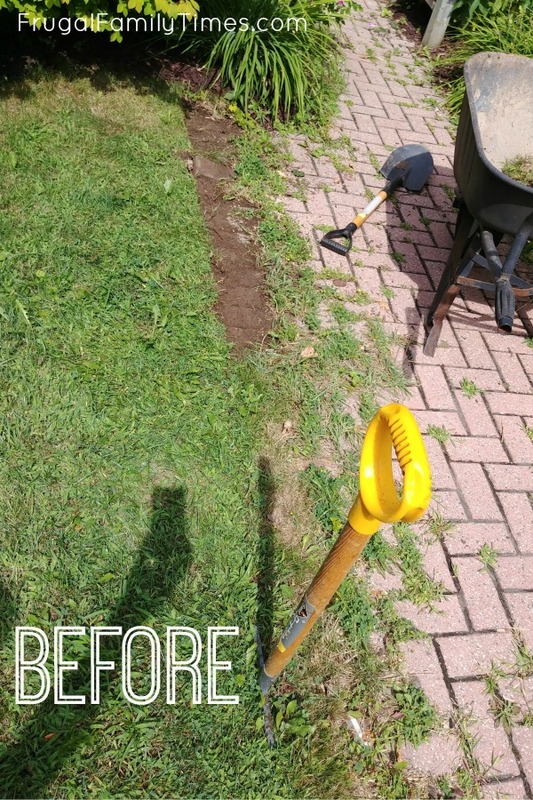 I ended up taking a few extra bricks out beyond the border row in any spots that the weeds had become too entrenched. Some seams were all roots. 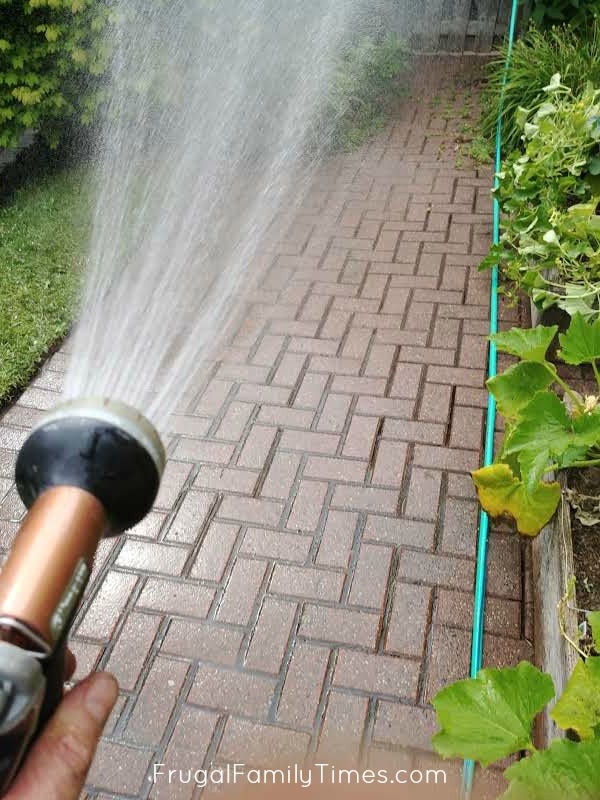 When you get things cleaned up you can begin testing the plastic edging in place. 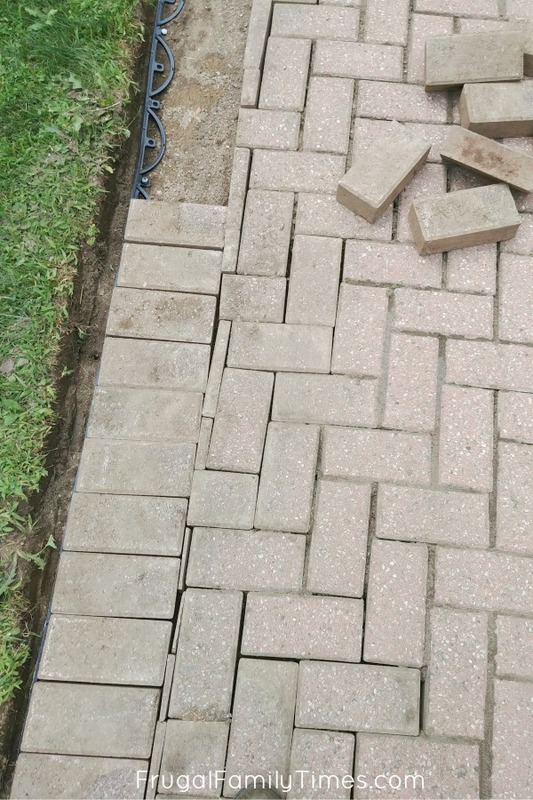 I used some bricks to verify depth and find out any areas that needed more cleaning back. Anyway, when you reach a point when you border is all set and the edging looks good, drive some spikes in (our product suggested every 20 inches). Re-lay the border course of brick pavers. 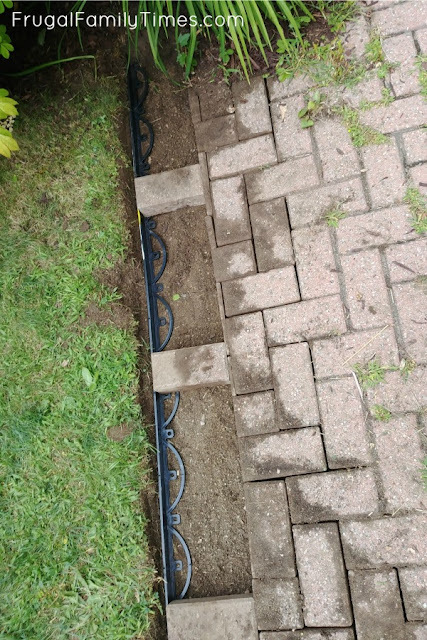 Leave a consistent gap for the polymeric sand between them - you'll see some in this photo that were pretty tight together. I went back down the edge after and spaced everything more evenly. Also, keep in mind that polymeric sand likes more than just a tiny gap - give yourself at least a 1/16"-1/8" to sweep the sand into. Add the polymeric sand and sweep into grooves. At this point, the project will feel almost done. You still have a lot of slow, even sweeping and tamping to do to get the polymeric worked into all the joints. 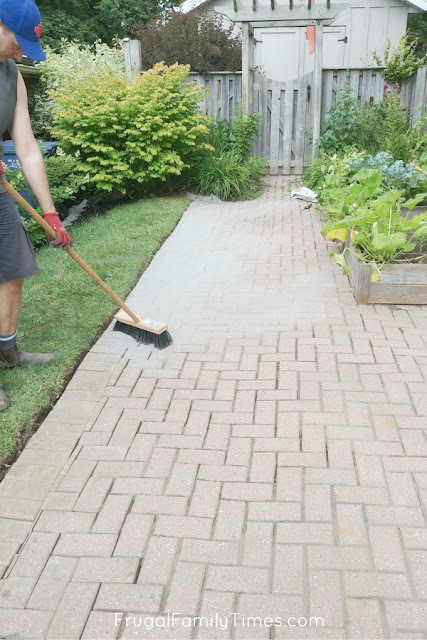 Take your time and try to keep the broom bristles evenly working over the paver surface. If you can sweep at a 45-degree angle to your seams, that helps too. The closest analogy I could use to describe this process is grouting tile. But slower and with a lot more tamping and tedium. Wet the polymeric. I started the 'mist' setting on our nozzle and gave everything a light dampening. I worked it all over a bit then finished the 'garden' setting. Keep the water moving and don't let any puddles form. Now that the edging is done along the side, we are pretty confident we won't have to do this bigger job again. Our plan going forward is to do a refresh every 3 years. That's how long the driveway stayed looking great before light weeds started to root themselves in tiny cracks. In 3 years time, we will pull any stray weeds and then do a top-dressing coat of polymeric sand again. It will mean sweeping it into the cracks again, wetting it and letting it set. Not a very tough job when you compare it to the hell that it hand weeding a driveway or patio! 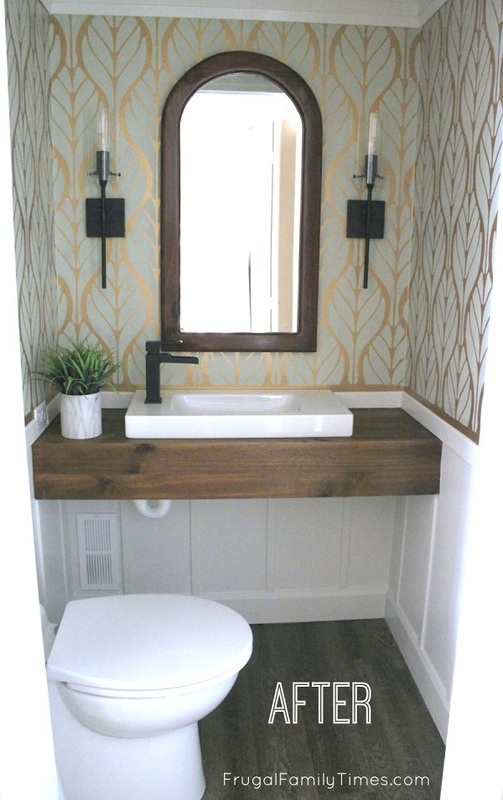 You can find more of our Outdoor DIY Projects here.